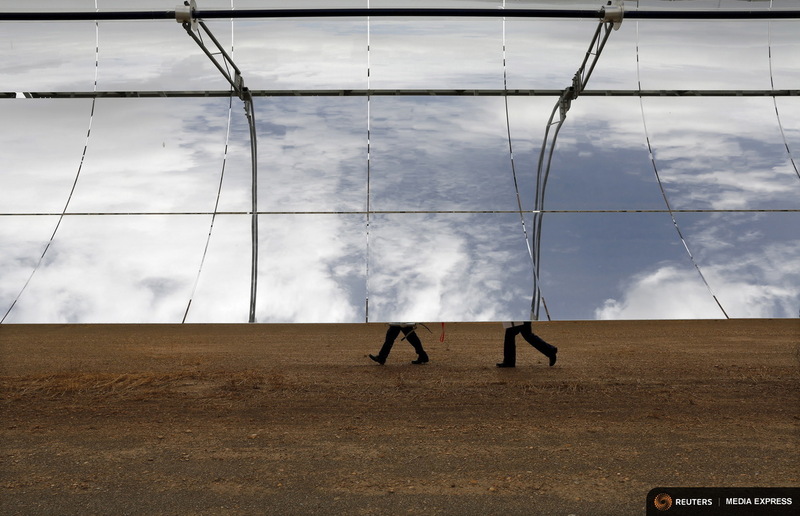 On a barren, sun-baked plateau in southern Spain, row upon row of gleaming mirrors form one of the world’s biggest solar power plants and harness the sun’s power even after dark. Near the town of Guadix, where summer temperatures often top 40 degrees Celsius, the main sound at the site is a whirring of motors to keep the mirrors – mounted on giant steel frames – tracking the sun as the Earth turns. The Andasol plant, whose name combines the local Andalucia region with the Spanish word for sun – “sol,” provides electricity for up to about 500,000 people from about 620,000 curved mirrors. The glass alone would cover 1.5 square km – the size of about 210 soccer pitches. Installed electricity generating capacity at this semi-desert site is about 150 megawatts. There is little sign of life here, at an altitude of 1,100 meters near the snow-capped Sierra Nevada range. Some hardy red and yellow flowers grow around the fringes, a few pigeons flap past and workers say that the odd fox lopes by at night. The environmental benefits of clean energy are judged to outweigh the scar to the landscape from the mirrors, which are visible from space. The land is infertile, there is little wildlife and few people live nearby. The biggest regional city, Granada, with about 240,000 people, is 70 km away. 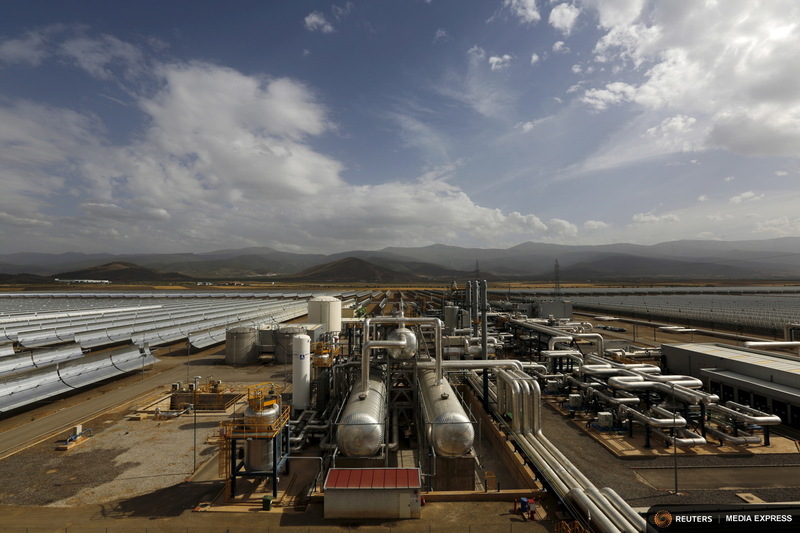 Andasol was Europe’s first “parabolic trough solar power plant” when its first section opened in 2009 – California has the biggest. Sunlight bounces off the mirrors to heat synthetic oil in a tube to a blazing 400 degrees Celsius. That energy is in turn used to drive a turbine, generating electricity. At Andasol, some energy also goes into a “heat reservoir” – a tank containing thousands of tonnes of molten salt that can drive the turbines after sundown, or when it is overcast, for about 7.5 hours. That gets round the main drawback for solar power – the sun does not always shine. The system is very different from better-known rooftop solar panels that transform sunlight directly into electricity. Facts and Opinions is a boutique journal, of reporting and analysis in words and images, without borders. Independent, non-partisan and employee-owned, F&O is funded by you, our readers. We do not carry advertising or “branded content,” or solicit donations from foundations or causes. If you appreciate our work, help us continue with a contribution, below, of at least .27 per story — or purchase a site pass for at least $1 per day or $20 per year.